Are you racing in the Back Cove Weekly Series tonight? It is the last race of the season, and this year there are not just overall winners but also age group awards! Amongst the highlights, are the race for the overall winners. For the women, Michelle Lilienthal wins unless Leah Frost runs an 18:33 and beats her by at least 36 seconds. For the age group awards, we have a mix of people who have locked their divisions and those who may have to race to maintain their lead. Avery Horne is a lock for female. If Ryan Morrison wins the overall title, Joseph Skerritt wins unless Peter Dininno runs 16:38 and wins by at least 2:22. Otherwise, Ryan Morrison is a lock for male. Karisa Morin is a lock for female. Pete Bottomley is a lock for male. Donna Jones is a lock for female. Richard Labauve is basically a lock for male unless Don Zillman runs 16:08 and beats him by 9:34. 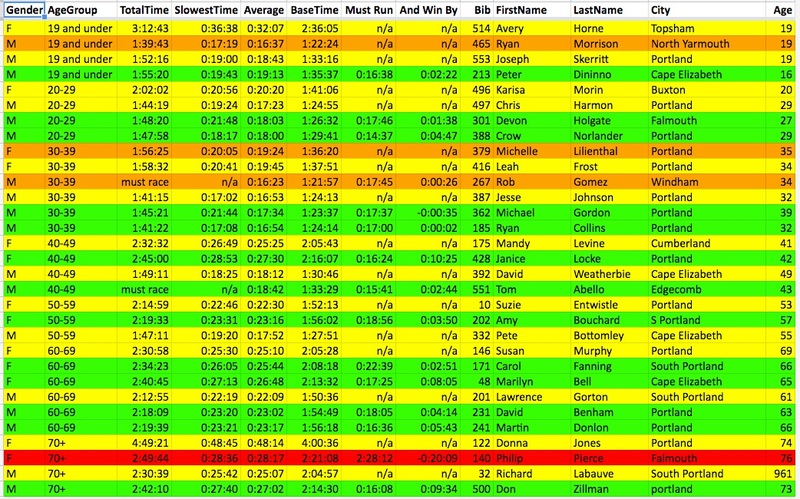 For the age groups, yellow lines denote the current leaders and green lines are folks who could potentially catch them (the cutoff being pretty much anything slower than 14 minutes whether that makes sense or not.) The orange lines are the overall leaders.